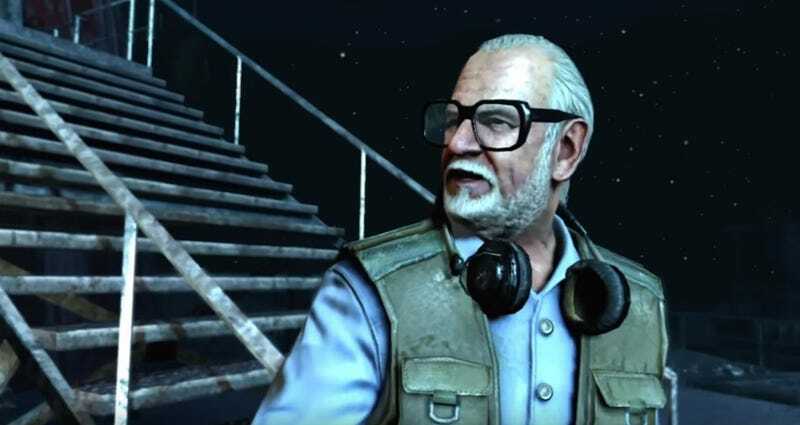 The passing of George A. Romero on July 16 has the Call of Duty community remembering the legendary filmmaker in a fun zombie fashion. The Night of the Living Dead creator was the zombie boss in 2011's “Call of the Dead” Zombies DLC map for the original Black Ops. The plot of the star-studded story was as such: While filming his latest horror masterpiece, Romero is bitten and turned into a zombie. The film’s cast, Sarah Michelle Gellar, Robert Englund, Danny Trejo, and Michael Rooker, served as the avatars who had to fight off hordes of zombies as well as their very angry and undead director. Romero is credited with fueling the pop culture obsession for zombies, and the Call of Duty Zombies community is showing much love and respect for the writer, editor, and filmmaker. Several fans recorded tribute streams for Romero on Sunday, and many more used the comments sections to pay their respects. NGTZombies paid respects by uploading a short YouTube video with the “Call of the Dead” intro, and the comments section of his video shows an outpouring of love from Romero fans. Others, such as Wirf, KrazyRabb1t, and popular Zombies YouTuber MrTLexify, livestreamed their attempts to either survive the wrath of Romero—or avoid shooting the zombie boss at all. On a personal note: Thank you, Mr. Romero, for decades of horror classics. I’m forever obsessed with zombies, and I’m still personally terrified from watching Monkey Shines when I was far too young.